The use and exchange of electronic data and documents to support international trade transaction processes, otherwise known as Paperless Trade, is an important means of facilitating trade and one of the keys to reducing trade costs and enabling developing economies to more effectively use of trade as an engine of growth and sustainable development. A pioneering Global Survey on Trade Facilitation and Paperless Trade Implementation was conducted by the United Nations Regional Commissions (UNRCs)1 between September 2014 and May 2015 to provide more detailed cross-country information on the implementation of trade facilitation measures in general, and Single Window and other paperless trade measures in particular. 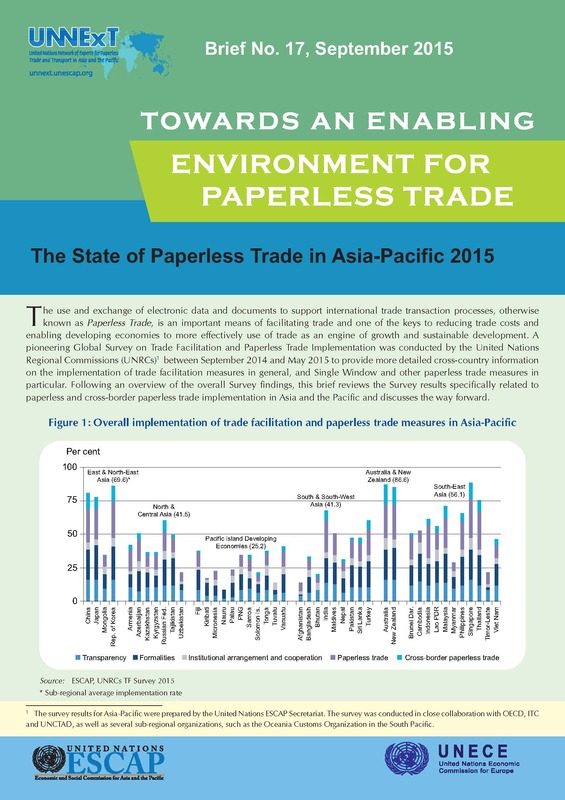 Following an overview of the overall Survey findings, this brief reviews the Survey results specifically related to paperless and cross-border paperless trade implementation in Asia and the Pacific and discusses the way forward.